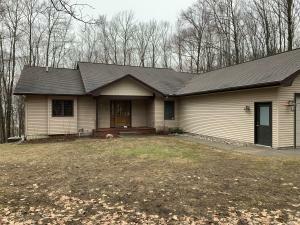 PEACEFUL WOODLAND RETREATEnjoy life in the woods at this well-maintained, vinyl-sided ranch just minutes north of downtown Gaylord on over six acres. Fabulous foyer; large living room with gas fireplace along with tasteful dining room looking out at the beautiful woods; open kitchen with appliances included and new backsplash; main floor master suite with dual sinks, spacious shower and walk-in closet, plus two more bedrooms and full bath and laundry complete the main level. Walkout has another full bath along with potential 4th bedroom - and plentiful space for workshop and family room. This great house has forced air heat and central air for those muggy summer nights and also heated 2+ car garage.. Mt Vernon Hills also offers trails for exploring. Enjoy life with abundant wildlife! Full Baths: 2 Half Baths: 0 Lot Size: 244x377x190x154x150x641..